A psychedelic fairytale for the modern age, A Greater Monster is the mind-bending second novel by the author of the acclaimed Death by Zamboni. This darkly poetic tale takes you on a trip into a radically twisted alternate reality that reflects civilization like a funhouse mirror. Along the way, you'll encounter sphinxes, gods, living skeletons, witches, and quite possibly the strangest circus ever imagined. 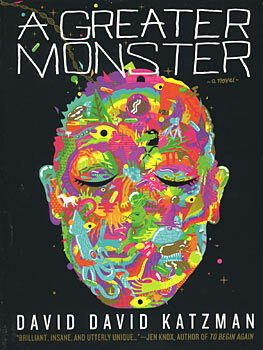 Innovative and astonishing, A Greater Monster breathes new life into the possibilities of fiction. "I can't express how brilliant my favorite scenes in A Greater Monster are. In this extraordinary work, Katzman pushes language to do things, which are truly astounding." "A Greater Monster is...a spiritual (and carnal) quest that reads like Alice on acid, while channeling every trash sci-fi nightmare Creepy Tales had to offer." "Beautiful mystic-schizo DayGlo wordage. Poetic, peripatetic and diuretic prose that befuddles, enchants and amuses the reader at the same time." "This is bizarro fiction at its most intense. It contains scenes and unique designs that seem engineered by some Mad Hatter and Chuck Palahniuk cross-breed."